WHAT A DAY! Imagine spending the morning with over 100 students actively engaged in friendly competition about the same 28 BOOKS? It's teacher/librarian heaven! 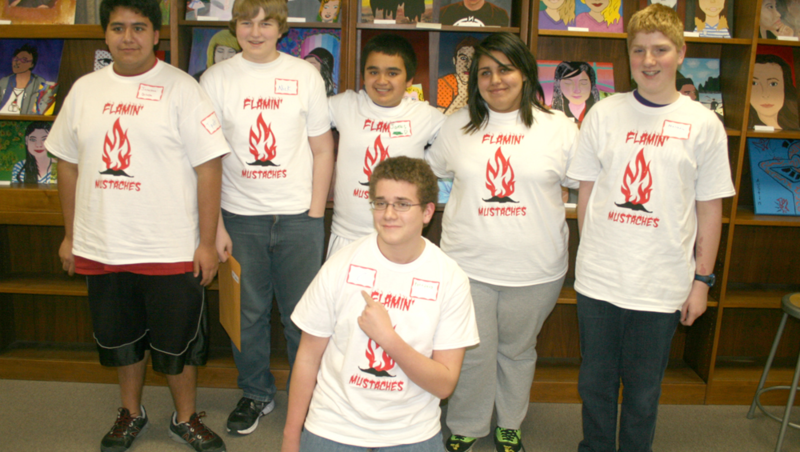 Marshalltown High School hosted the Grand Battle for the Iowa High School Battle of the Books (IHSBOB) on April 26th. The state finals included 16 teams from around the state battling trivia from 28 books on this year's list. We heard high schoolers rock-solid with book knowledge jump to answer questions, congratulate others, clap for others, cheer each other on, and have a wonderful time discussing award-winning literature. We saw coaches (teachers, librarians, and parents) bring their students from all over the state of Iowa, some leaving before dawn. We saw volunteers, students, friends, and colleagues give of their time and talent to provide a challenging and entertaining time for the battlers. We saw kids on the edge of their seats while they visited with Mike Mullen, author of Ashfall (one of the battle books). Was it a lot of work? You bet. But the smiles, hugs, kids reading, and friendly competition made it all worthwhile! We know students become better readers when they practice reading. So when a group of incoming freshmen requested a high school level Battle of the Books, we started looking. These freshmen had participated in Battle of the Books at middle school and elementary levels and wanted the same in high school. The problem was that we couldn't find a high school competition in Iowa, other states wouldn’t let us play, and national programs were way too expensive. So we made up our own: IHSBOB. In 2008, the competition was open only to schools in AEA267 (we had no idea what we were doing!). After a successful year, we went state-wide. Each year, more teams register and compete—usually between 75-120. We now have a website, Twitter account, and Facebook page. Special credit is due to Joa LaVille (Marshalltown Public Library) and Cheryl Carruthers (AEA267), who have been staunch supporters since the beginning. Without them, IHSBOB never would have gotten out of planning. The mission of IHSBOB is to introduce Iowa students in grades 9-12 to award-winning literature. Our goals were to help students read quality literature they might not otherwise try, practice reading, and have fun! There are no assignments and no book reports—just reading and collaborating as a team. The book list is chosen based on national awards: Alex Awards (adult books that appeal to young adults, ages 12-18), the Andre Norton Award (young adult science fiction and fantasy), Coretta Scott King Book Awards (African American authors and illustrators), Scott O’Dell Award (historical fiction), Pura Belpre Award (Latino/Latina writers and illustrators), Schneider Family TeenBook Award (artistic expression of the disability experience), William C. Morris Young Adult Debut award (debut authors). In addition, we consider the books nominated by Iowa students for the Iowa High School Book Award, sponsored by the Iowa Association of School Librarians. We share our lists with major vendors in the state and publish it to our website. Volunteers (teachers, librarians, secretaries, and para-educators) read the books and write hundreds of questions for the competition. Teams of 4-6 students register in the fall. Although the focus is students in grades 9-12, they don’t have to be from public schools. Teams from public libraries, home school, and academies have joined our competition. All are welcome! Coaches work with their teams throughout the school year in various ways. Some teams meet weekly, while others meet less often. Students often divide up the books on the list and focus on a few titles, making sure someone on the team has read each book. In some cases, students read every title on the list. To prepare for the competition, some teams write their own questions and hold mock battles at their home school. There is no one perfect strategy; each team has to decide what will work best for them. Students from Charles City described their preparations and expectations in an interview with the Iowa Public Radio Talk of Iowa shortly before the competition. We hold an online test competition in March, and the top 16 teams qualify to compete at the Grand Battle in Marshalltown in April. This is a face-to-face game-show style competition. Students spend the morning at Marshalltown High School battling it out for the top honors. Instead of trophies and medals, winners take home copies of books from the next year’s list for their school library. Each year, student and coach feedback helps us improve the competition. School year 2017-2018 will be our TENTH year! Lesson learned: if you can't find what you want, create your own! The 2017 book list is available at our website. We hope you’ll join us next year!